The Vischer Ferry Nature & Historic Preserve is located along the southern border of the Town of Clifton Park near the Mohawk River. This historic preserve is about 700 acres large, and it features a wetlands habitat as well as remnants of the original 1800's Erie Canal towpath. 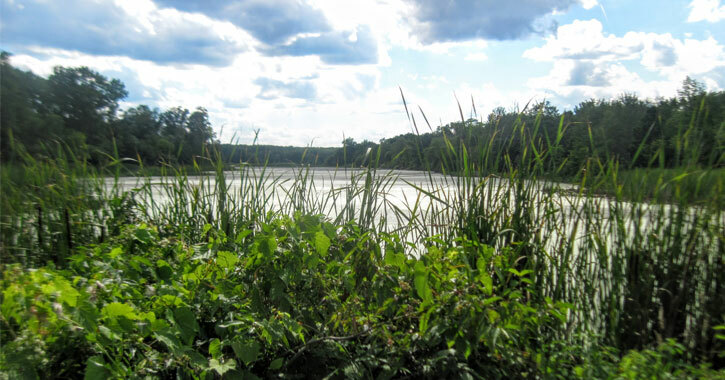 Back in 1977, the New York State Department of Transportation teamed up with the Town of Clifton Park to establish about 450 acres of land in the Vischer Ferry Historic District as a nature preserve. Not only would this preserve ensure the protection of the historic site, but the public would be able to appreciate and explore the natural area. Since then, the nature preserve has grown to include about 700 acres. It is mainly owned by the New York State Canal Corporation and managed by the Town of Clifton Park. In 2006, the New York State Department of Environmental Conservation designated the preserve as a Bird Conservation Area. The Vischer Ferry Nature & Historic Preserve is bordered by the Mohawk River to the south and a long section of Riverview Road to the north. There are four main entrances to the preserve that are open to the public year-round. 1. Whipple Bridge	Entrance - This is the most popular entrance to the preserve, and it is located across from the intersection of Riverview Road and Vanvranken Road. There is a small parking area where you can leave your vehicle and then head into the preserve. A bike rack and picnic area are available at the site. 2. Clute's Dry Dock Entrance - Another entrance is located one mile east of Whipple Bridge along Riverview Road. Known as Clute's Dry Dock Entrance, there is a small parking lot at the site. An interpretive kiosk is near the trailhead. 3. Ferry Drive Gateway Entrance - If you head west along Riverview Drive from the Vischer Ferry General Store, you'll soon reach Ferry Drive. Follow Ferry Drive to the end, and you'll get to the Towpath Connector Trail, which heads toward the preserve. 4. Sugar Hill Road Extension/Vischer Ferry Power Dam Entrance - At the intersection of Sugar Hill Road and Riverview Road, if you follow Sugar Hill Road south, you'll reach a parking lot and the Lock 7 Dam Overlook. You can park there, and then follow the Scenic Bikeway to the Ferry Drive Gateway Entrance. The nature and historic preserve features multiple trails that are great for hiking, nature walks, and mountain biking. The main trail is the Vischer Ferry Trail, which is a moderately trafficked loop. It is about 4.5 miles long, and you can easily access it from the Whipple Bridge Entrance. Some of the historic sites within the preserve include the Double Lock 19, Clute's Dry Dock, Forts Ferry, and the old canal towpath. Historic signs are situated throughout the preserve to help you learn a little about the area. In addition to hiking and biking, the preserve is a great place to visit for year-round activities, including fishing, snowshoeing, cross-country skiing, and even birdwatching! Dogs are allowed on the trails, but they must be leashed. The preserve is open to the public from sunrise to sunset. Maps are available from the Office of Parks, Recreation and Community Affairs (at the Clifton Park Town Hall).